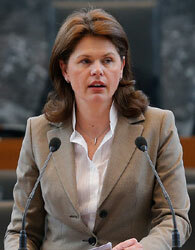 Slovenia´s government has presented the 2014 budget to the Parliament. Prime Minister Alenka Bratusek has linked the approval to a vote of confidence. However, the budget approval is not the biggest risk factor for the ailing country. Slovenia´s fiscal situation remains more than tense. Because of the sharp recession and the bank recapitalization measures, Slovenia´s will cause a substantial increase in the public debt ratio. This article includes a total of 493 words.